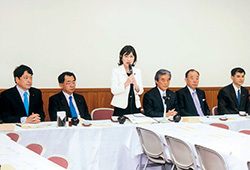 On January 27, the Party's Special Mission Committee to Restore the Honor and Trust of Japan (Chairperson: Hirofumi Nakasone, member of the House of Councillors) discussed problematic depictions of comfort women in U.S. history textbooks that are at odds with the position of Japan. The textbook in question is called "Tradition and Encounters" and is used to teach world history in public high schools in Los Angeles and the surrounding suburbs. They state "The Japanese Army forcibly recruited, conscripted, and dragooned as many as 200,000 women aged 14 to 20 to serve in military brothels." The Japanese Ministry of Foreign Affairs through the Consulate General of Japan in New York has been requesting the publisher to correct the descriptions since mid-December last year, but has yet to receive a response. The book is also reportedly on a list of candidate textbooks in Tennessee, Georgia, and two other states. Members in attendance were concerned that there may be other similar cases outside the United States and requested the ministry to expedite the creation of a system for collecting information. Policy Research Council Chairperson Tomomi Inada emphasized, "The comfort women is not an issue of the past. It continues to be an infringement upon the human rights of Japanese children living in the United States." She said that this will continue to be an issue that the Party addresses. Copyright(c) The Liberal Democratic Party of Japan. All rights reserved.